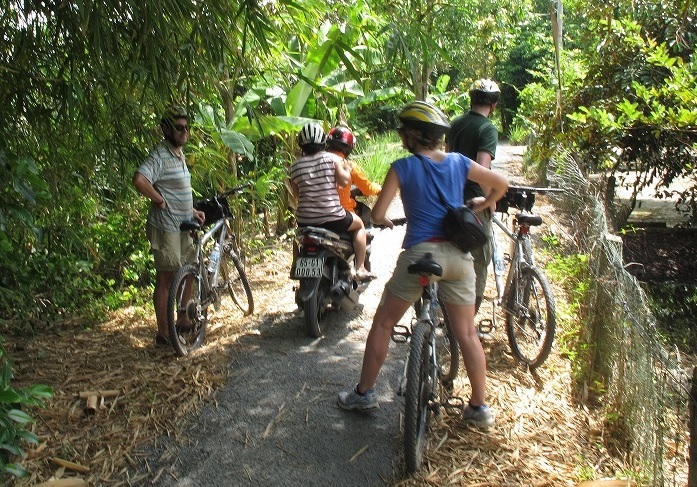 I was on a three-day bike riding tour of the Mekong Delta, south of Vietnam. The tour started with a two hour drive from Ho Chi Minh City, a boat ride and a long lunch. There were seven riders. We threw our bags in the minivan and the easy, flat road, 20km ride began. We rode passed bridges, canals and fishing villages. Life was good until I got lost. Read about that here. On the second day, we felt the dust, heat and humidity immediately. This was a full day ride. We rode through small dirt roads at the beginning but the major roads soon emerged out of nowhere. We weaved through countless trucks and motorbikes while dodging the endless stream of oncoming traffic. We skilfully navigated through some broken and bumpy roads. The Irish girl threw up twice. Then we hit some heavy mud. We dragged out bikes through and pushed on. It only got hotter and we only got sweatier. We arrived at the guest house not a moment too soon and recuperated for the next day. On the third and final day, we started with a trip to a floating market before the riding began. The conditions were kinder but I was mentally spent. In the last 5km or so, I stacked it twice. The first time was avoiding an oncoming motorbike on a narrow country dirt road. I rode my bike into the bank of the Mekong River. I fell first. The bike followed. Grosssss. The locals got off their motorbike and giggled before helping boyfriend Lindsay pull me and my bike out of the water. Yeah yeah, hilarious. I rode on in wet clothes. The second time with less than a kilometre to go, I fell on some broken road. I scored two wounds – one on each palm. Now, I was a bike rider! As we were near the end, the tour guide called for a motorbike to take me and my sorry arse back to the van. Lindsay rode the last kilometre with my bike. That night, back in Ho Chi Minh City, we partied with our new Irish friends. We did the three days; two nights tour from My Tho to Cai Be, Vinh Long and Can Tho (SBL8) with Sinhbalo adventure travel. The distance over three days (approx 100km) was manageable but it was a technical ride – bumps and all. The tour was not well organised but with a bit of flexibility and good humour, it was totally fine. If you’re not flexible or good humoured, do something else. This seems like an amazing adventure! Haha! Thanks. It probably wasn’t THAT hard. I was probably a bit soft. Plus they don’t always tell you, they just tell you that it’s very easy and very flat. I would love to go back to Cambodia and do more exploring like this. Congrats anyways!